A “Ministry of Citizenship” was carved out of the Home Affairs Ministry (the rump was renamed “Public Security Ministry and given to the chump Khemraj Ramjattan) after the PNC-led coalition won the 2015 elections, and it was handed to Winston Felix, former Commissioner of Police (CoP). Apart from Roger Khan claiming a “relationship” with him, Felix was also caught on an infamous taped conversation with the Chairman of the PNC. At the time, there were furious denials about the revealed insider links between the CoP and the PNC politician – especially since they were discussing the Agricola Massacre and how to head off the PPP Minister of Home Affairs. Well, after Felix was made minister, there could be no denial of his political allegiance; although, unlike Granger, he didn’t come out and openly admit he was a member of the PNC all the years he was in uniform. But the question arose as to why Felix was given the specially created portfolio. And the answer, not surprisingly, had to do with “fixing” the list of electors by fiddling with the data that go into making that list. And all of this data – records of births, deaths, registration, etc – passes through the Felix new bailiwick! After all, it was by fiddling with these records that Burnham “fixed” the first post-independence elections in 1968. So the PNC would’ve known all the ‘ins and outs’ about rigging elections. The US declassified records reveal that Burnham had taken a page from Eric Williams’s playbook over in T&T and also brought in some West Indians from the smaller islands in an effort to bolster his minority numbers against the PPP at that time. The islanders, however, couldn’t take the “rough and tough” hinterland experience, and that experiment suffered a premature death. So when the PPP heard about 5485 Haitians allowed into Guyana by Felix, with no records of them leaving, could you blame the PPP for their antennae sticking up to attention?? Well, after some hanky-panky over some naturalisation pics in the press, questions were raised about whether the Haitians had been given citizenship. But guess what?? Felix released some numbers that just don’t make sense. He claimed that, since 2015, only 888 persons IN TOTAL have been granted citizenship!! And of these, THERE HASN’T BEEN A SINGLE HAITIAN!! The question, of course, is: Where have all the Haitians gone?? Felix now says they are just “passing through” on their way to French Guiana!! But how come none of them was detected by the Felix Immigration officers on the Corentyne?? 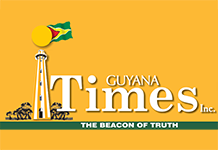 If nearly six thousand persons can slip over the Corentyne River undetected, surely something’s rotten in the state of Guyana. Rigging? PM Nagamootoo certainly has a lot of time on his hands; but then, he just has a weekly Chronic column to eke out!! This week, he claimed “the regime’s surrogate media have unleashed a brutal, X-rated campaign of rage and hate against the APNU+AFC Coalition and its officials.” Whew!! To which the acting President said unctuously, “As always, the Coalition Government would issue righteous responses, buttressed by the biblical exhortation, a gentle or soft word turns away wrath”! “I know that ALL of (our Ministers) have fully supported the Code of Conduct that prescribes standards of integrity, accountability and transparency”!! He even forgot the Code’s been deep-sixed?